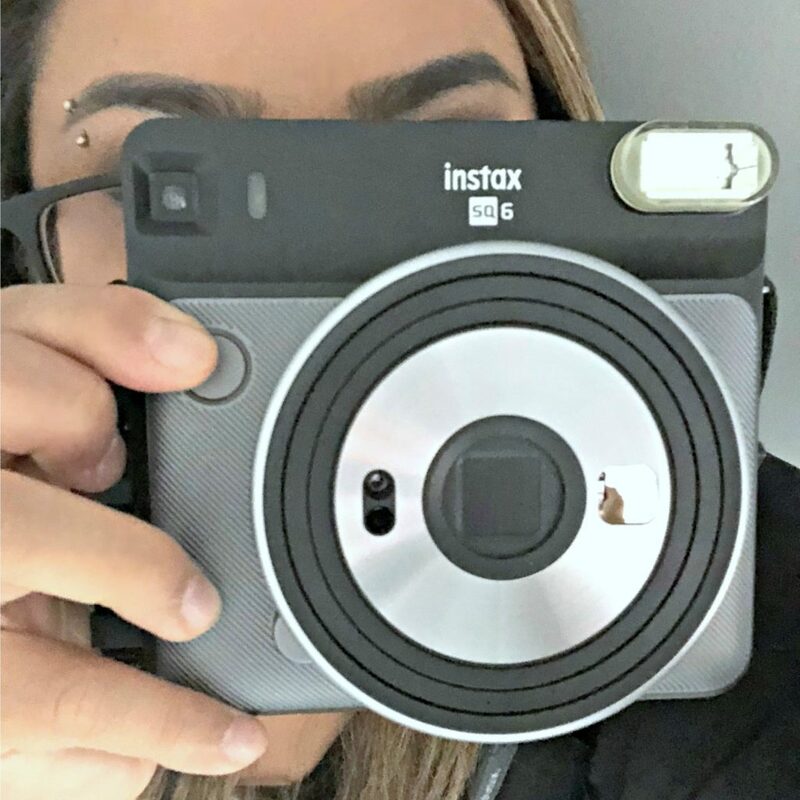 You are here: Home / Kids / Our Life, Beautifully Squared with the Instax Square SQ6! 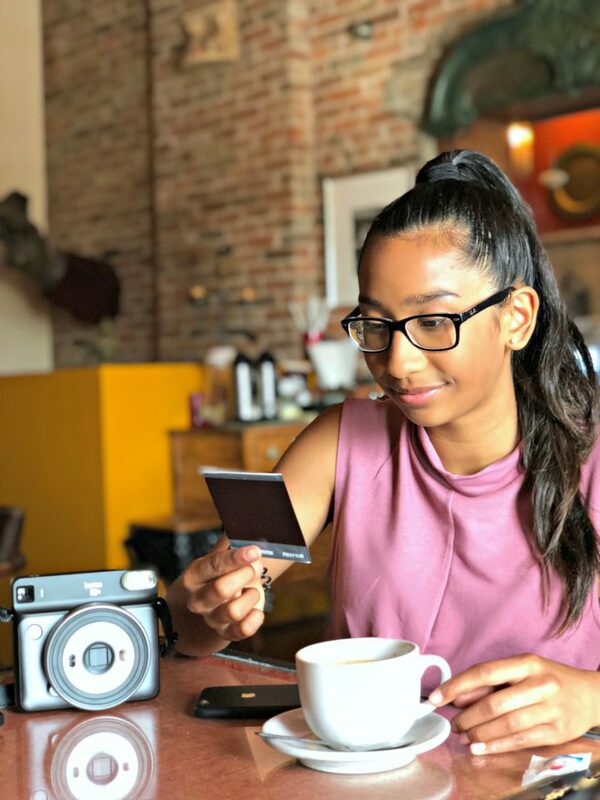 Life Beautifully Squared with the Instax Square SQ6! 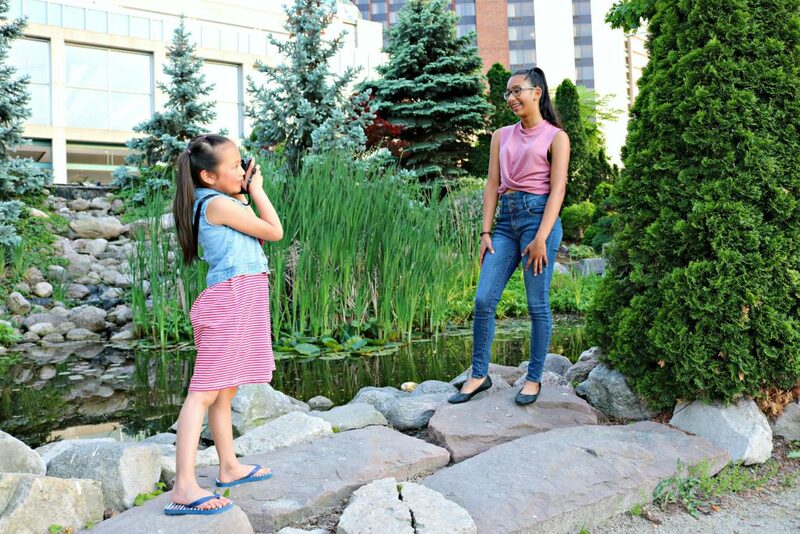 I am a mom of two beautiful girls and you better believe that I want to capture every moment of their life that I can. As a mom, there is no doubt in my mind that time is flying by. It feels like just yesterday they were born. With this in mind, I knew I wanted to capture the long weekend in the best way possible. Victoria Day weekend for us was typical, while we didn’t go away–we were busy. If you know us, we are travel junkies and while capturing those moments are always fun, capturing the everyday moments are just as important. 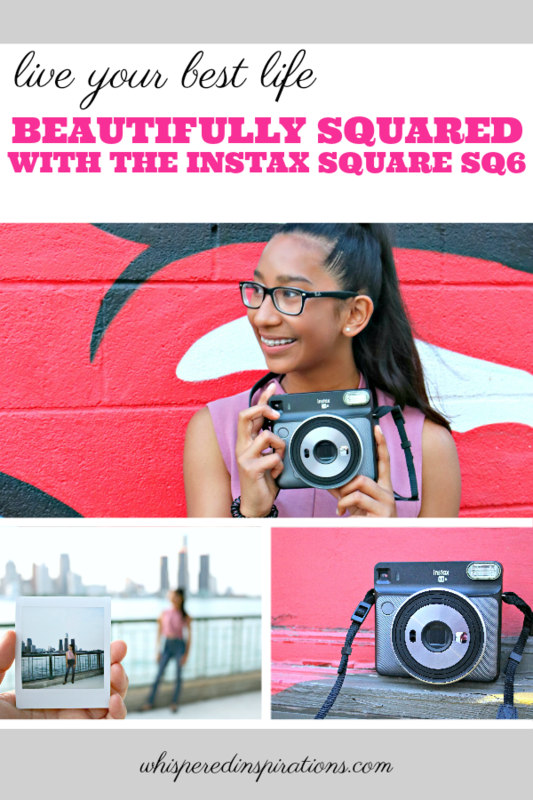 The Instax Square SQ6 Camera was just what I needed to help capture every special moment. I cannot even begin to describe how much I absolutely love the Instax SQ6. I’m a lover of all things vintage, well-loved, used, and old-school. While this camera is brand new, the fact that it is analog is so nostalgic. I adore the quality of the images (so vintage), and even the act of just pressing the shutter button and getting the picture instantly makes me geek out. I let the girls snap pictures so they can see the beauty of the world through a lens and capture something that doesn’t need to be shared digitally if you don’t want to. No time stamp, no negatives, no likes or comments. Just a perfect and beautifully squared memory to keep for always. 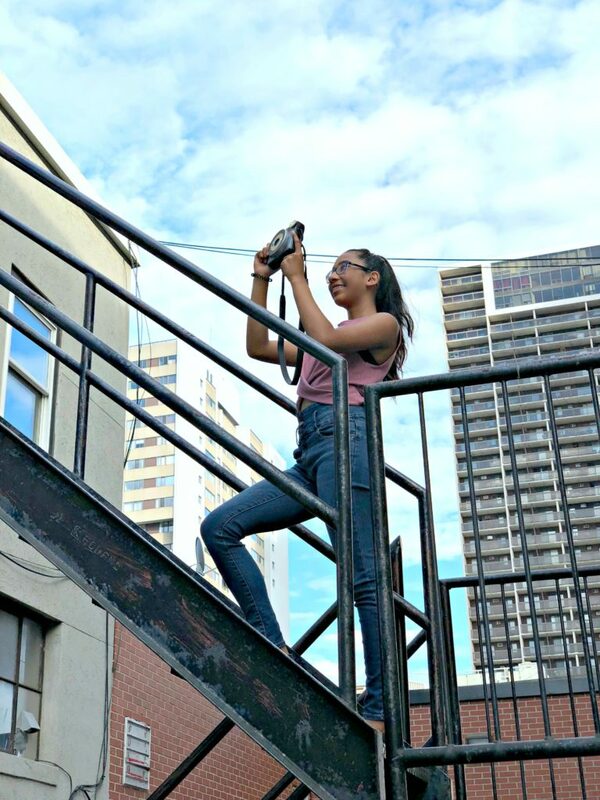 Read on to check out why you need to pick up an Instax Square SQ6 camera and to see what we did for the long weekend! With as much as I love displaying pictures, the square format is an easy go-to. Especially when I don’t feel like trying to choose between landscape or portrait mode. Square Format is just the right format for me. All you have to do is just pick up the camera and snap. Since the result is 1.5 times the size of Instax mini prints, there’s plenty of room to capture more of the moment and location. Plus, it is so easy to frame the subject with the little square in the viewfinder. 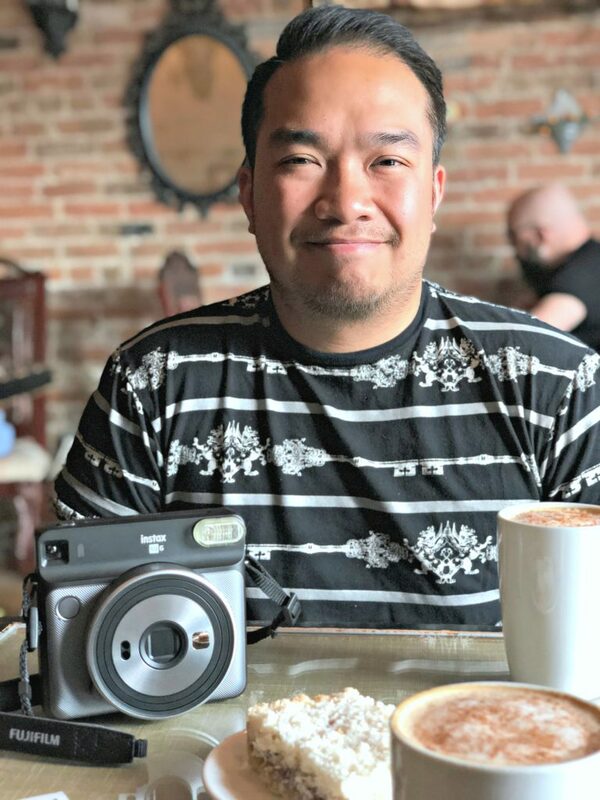 While we enjoyed the recent long weekend, I was able to play with the Instax Square SQ6 and capture some images of my family. Gabby has been begging me to take her to the local museum, so I enjoyed capturing fun moments of her. We didn’t take any inside due to the potential flash but, we loved this display outside of the museum. It was fun to appreciate art and then head out and enjoy the rest of the day together. It was the girls’ first time ever using a camera with actual film so needless to say, they were kind of excited. They are familiar with the Fujifilm Instax Square printer but, that requires just your phone. It was funny to see how they held it and were amazed at how it shot out a picture. Gabby developed a little technique, she held the camera from the top with her finger and set up her shot. Once she felt steady enough, she then clicked the shutter button. She wasn’t too thrilled when she took her first picture and it came out a bit blurry due to her movement. 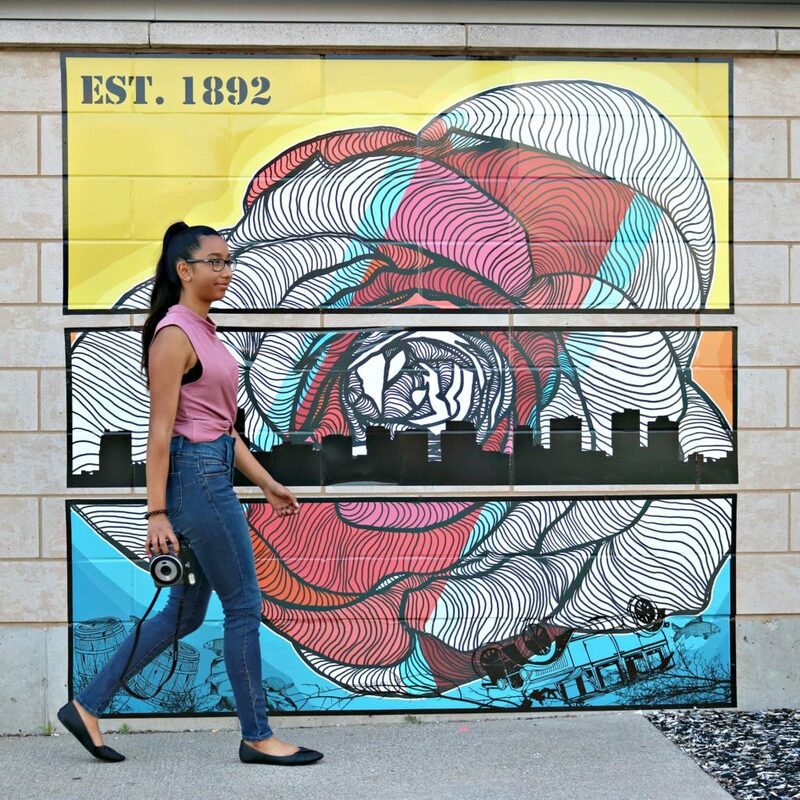 After enjoying the museum, we decided to hit up the waterfront downtown and go graffiti hunting because, well, it’s art! I’m not a person that has to have everything perfect, but I do love good design and when things are well built. I have to say that the Instax Square SQ6 Camera is a well-built camera that is perfect for our busy lifestyle. Not to mention, it’s actually quite the beautiful piece of tech. When we were at the park this past weekend, we pulled the camera out of my purse and had a blast taking pictures of each other. The girls got really into it and I love the strap that it comes with. Makes it easy to have peace of mind when little hands are operating it. The pictures also store really nicely, so I can put them on display when I get home. Not to mention, they can be used for DIY projects, scrapbooking, desk art–and more. I personally love that the Instax Square SQ6 comes in Blush Gold, Graphite Gray, and Pearl White. Aren’t these beautiful colors? I feel as though the camera design was well thought out. The feel of the camera itself has grip, along with texture. It can almost be considered an accessory when I pull it out of my purse to use. I’m not gonna lie, it looks great in pictures. In fact, Gabby has her eye on it because it’s so pretty. This past weekend, using the Instax Square Camera, I fell even more in love with it. It has functions I am familiar with and that’s always a good thing. It is straightforward to use and with just a few touches, you can change settings seamlessly. Here are all of my favorite functions of the camera. Automatic Exposure Control: This function can actually brighten the subject and the background. So you know you’re getting a good quality picture. Macro Mode: You better believe that this is one of my favorite functions. You can actually get up close and personal to take pictures and they’ll turn out perfect. Selfie Mode & Selfie Mirror: How perfectly old school is the mirror? I remember having a mirror on my phone to take selfies, though they weren’t called selfies back then. You can capture the area of your selfie in a mirror next to the lens. This mode adjusts brightness and focal length to the ideal level for the perfect selfie. Yes! Landscape Mode: Will help you capture subjects 2m away. Double Exposure: Now this one is cool! You can blend two pictures together in one print. 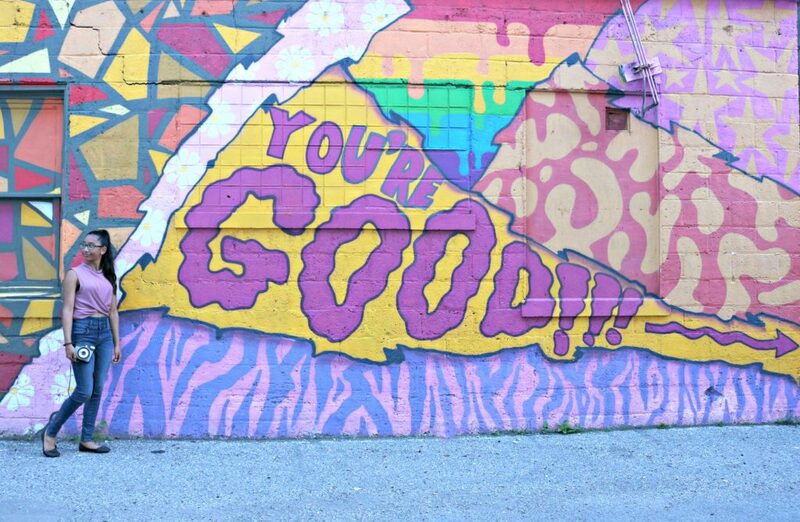 Get artsy! Light/Dark Mode: You can select the exposure of your pic. From low-key, normal, or high-key. We are coffee shop junkies, so it’s only natural that we would end up in one on any given weekend. Victoria Day weekend was no different. Caffe Lattes and organic coconut bars for the win! 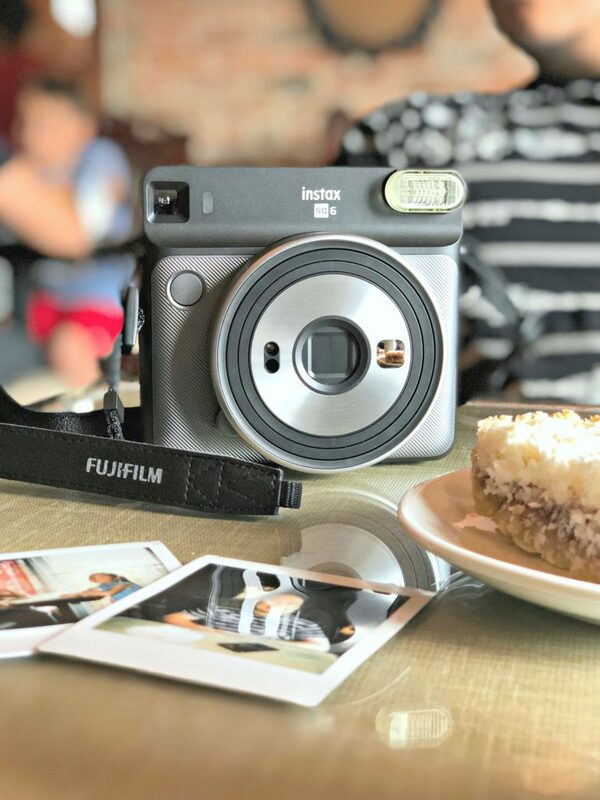 The Instax Square SQ6 kept up with us and produced beautiful pictures with the natural light coming into the cafe. When it did need flash, it wasn’t disruptive to other cafe-goers. Let me tell you, the ones who were there told us the camera was so cool. In between play, there are treats. Mimi could spend all day at the park if she could but, she sure will stop for a lollipop. Gabby took advantage of the stillness and snapped a couple pictures of Mimi. 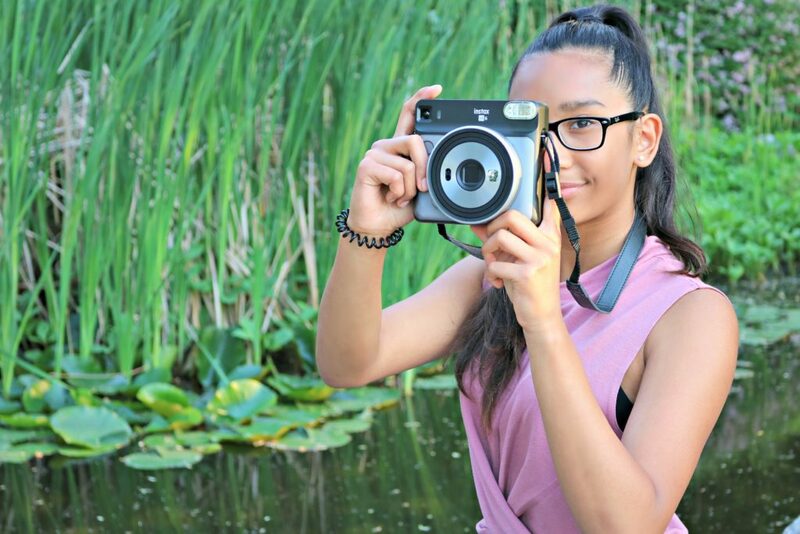 At this point in our day, I think Gabby had perfected her technique and is an official Instax Square SQ6 fan now. 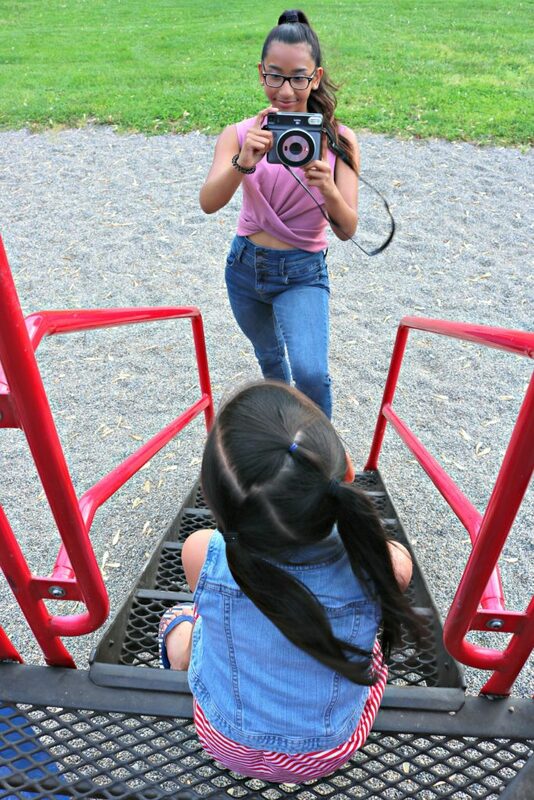 For me, there’s nothing more precious than standing by and watching my girls interact together and be excited about photography. Especially when all they’ve ever used were digital cameras. In a small way, I can share a bit of my childhood with them, not only in capturing film prints but in storing them for memory and posterity. 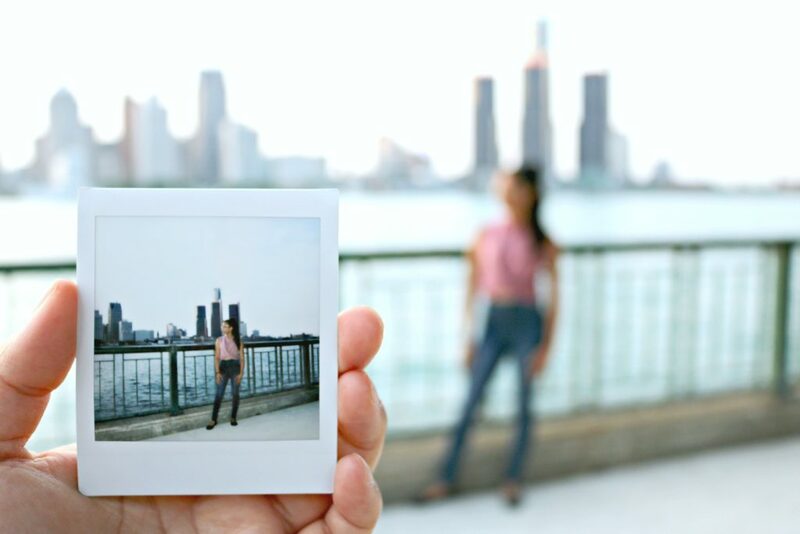 This weekend, the Instax Square SQ6 Camera didn’t disappoint. In fact, it made me appreciate the simplicity of film. Even though it is instant, it really has won my heart. I also went antiquing with the family. Our favourite shop is located on a farm and has barns and barns full of goodies. I was able to snap some pretty awesome pictures of our findings and things from my “wishlist.” One of those happened to be a 1950’s vintage rotary phone. It still works! You just can’t go wrong with this camera. 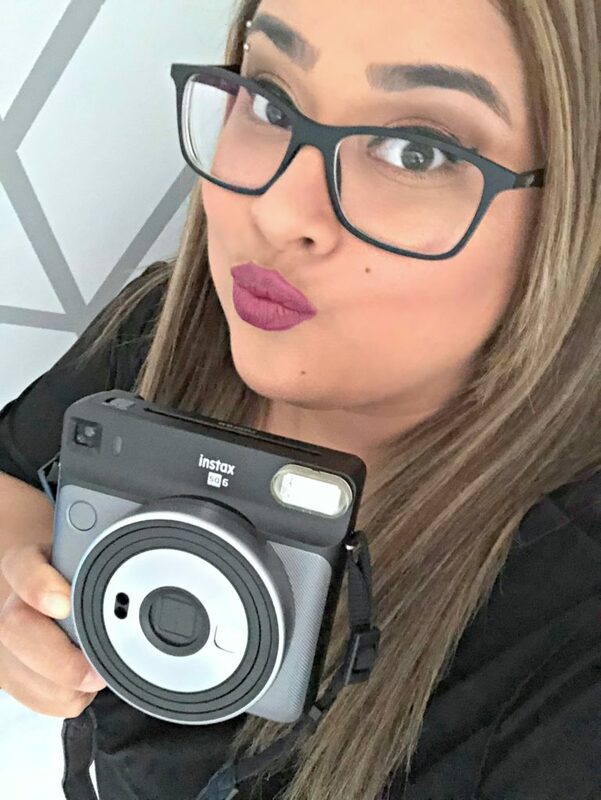 As a busy mom and a creator, I love how I can take instant pictures and use them as an added element to my digital pictures. You can get really creative with Instax prints so I look forward to creating even more with them. Most importantly, I am happy that I can capture all the precious moments that are fleeting and cherish those moments in time for a lifetime. I can tell you that capturing daily moments of our life has never been more fun. It is now one of my FAVOURITE pieces in my arsenal and I will continue to capture all the moments that we experience. Not to mention, I think I may have to buy Gabby one and she has her eye on the Blush Gold. In the meantime, I’m going to pick up some more instant film. I can’t decide if I want white or black frames this time. Visit Instax Square SQ6 for more information. 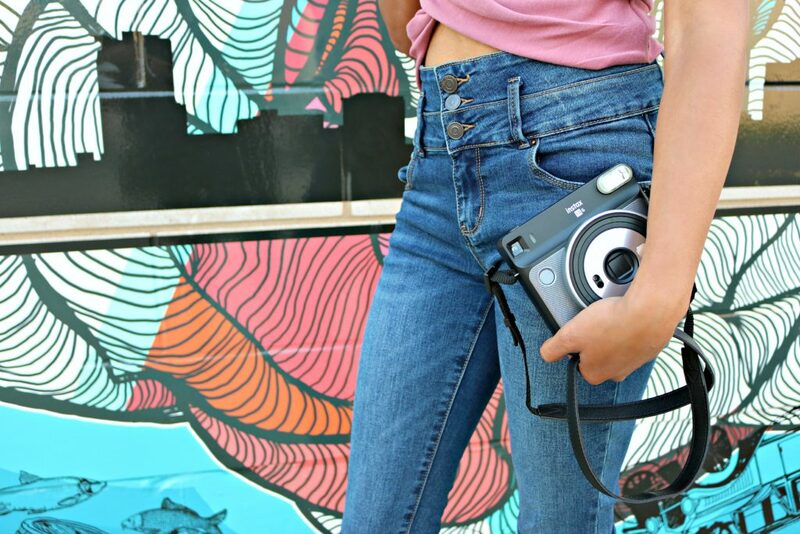 Get social with Instax and get the latest updates on Instagram, Twitter, and Facebook. 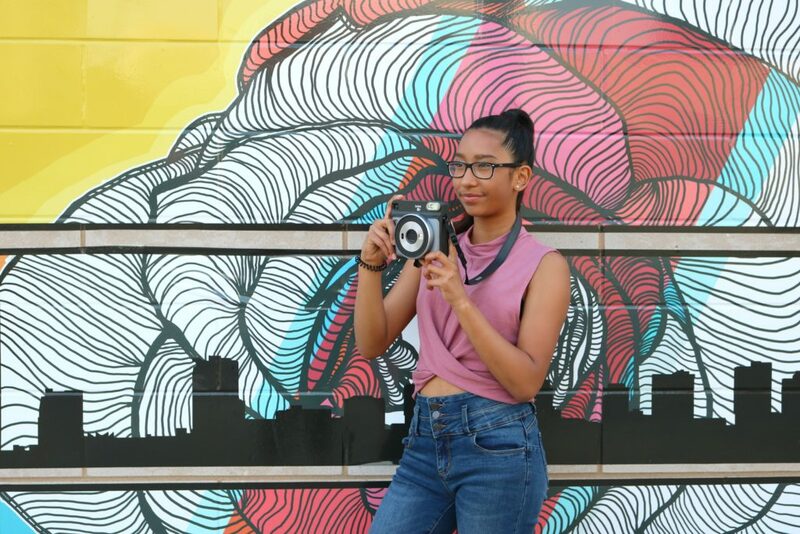 When is the last time you used an instant camera? Note: This post is sponsored by Instax. All thoughts and opinions are honest and my own. Previous Post: « Why You Need to Visit Kodaikanal! That looks like an awesome camera! Nothing beats the feel of that instant gratification of pictures on the fly. The Intax Square SQ6 looks like a great camera for an extra camera to preserve memories. I like that they develop on the spot. No need to send pictures to a photo lab for developing. Yes, that is the best part. I love having an instant photo. I definitely want to get one of these! They are super fun. I know my teenager would love it. Yes, they are SO fun and I bet that not only will your teen love it, you will too! I’ve seen these before. But I just wasn’t sure about buying the film for it. I think this would make a great gift for someone who wants those instant pictures. Maybe even teens for fun selfies with their friends. Yes, this is a NEW camera but, you have seen Instax cameras. I love having physical copies, so I do not mind buying film. So old school. Oh! I love how nice and big the prints are! Looks like the whole family would enjoy this camera! Yes, and I looove the Square format. This looks like such a great and fun camera! My daughter would love to have something like this to take pictures with her friends. She is always wanting to borrow my phone to take pictures, but this could be something just for her to use. Love this idea! Yes, she will love it. My kids adore it. Such a lovely camera! I’ve always liked cameras like this that allow you to instantly print the pictures and keep them in your wallet, journal, or wherever! I think this new one from instax is a must have! Me too, it is so nostalgic. I am LOVING it so much, no joke. 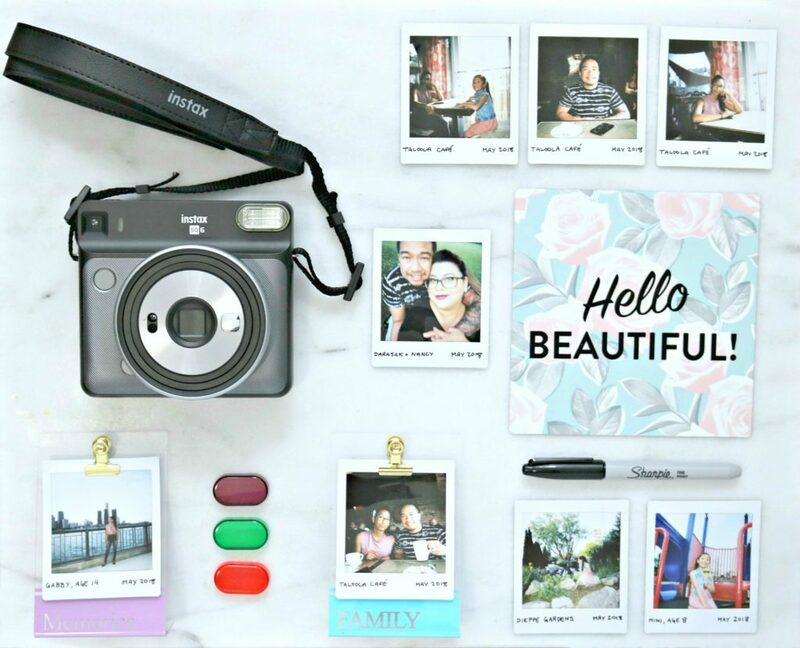 This is such a nice post and that Instax Square SQ6 camera looks so perfect for us because our family would love to capture every moment that we are together, I will definitely check this out. Aww, thanks so much Rose. Yes, we love it and I cannot wait to continue to make more memories with the fam and capture them. 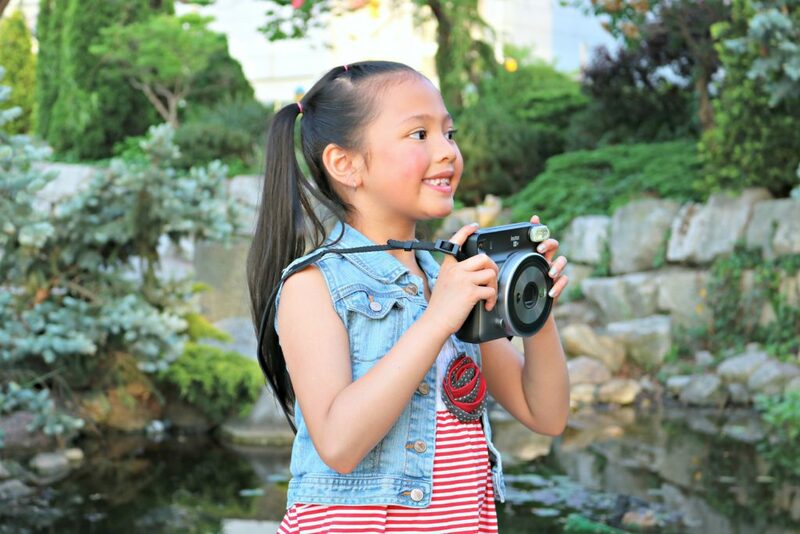 There are so many ways for kids and young ones to get involved in photography now. From phones to great cameras like this they can really express their artistic side. You are so right. This helps them to be creative for sure. I love mine! Actually the kids love it even more than I do! I love seeing the world through their eyes so I’m happy to share. Yes, it is so much fun! 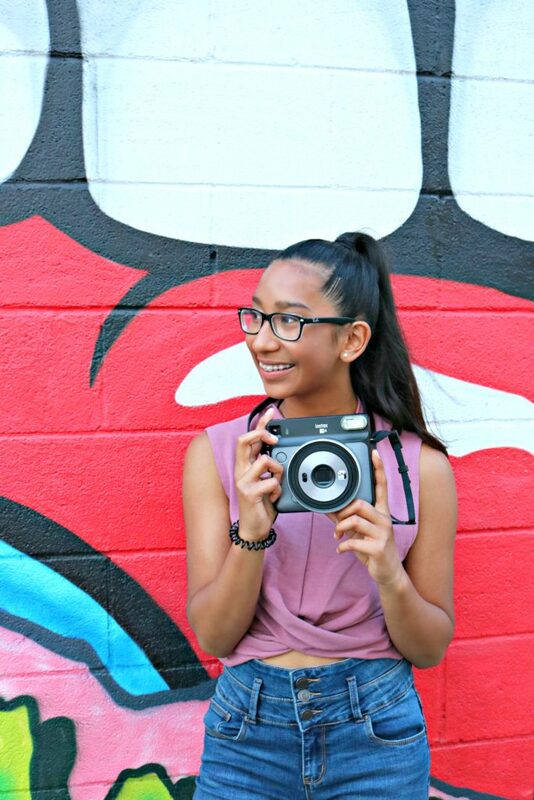 My daughter has a different Instax camera that she really likes. This one looks great too. It’s such a fun idea for kids, and it makes a great gift. It really is a great camera for the whole family! I agree. I love the square format pf this Instax sq6. And I love the pictures you made! Beautiful! WOW ITS BIG lol, I never knew that they were so big!! It is so lightweight! I did not find it so big, maybe it is just me! LOL. My teen and younger daughter loved it. It is just a fun to use camera! I haven’t used an instant camera in years. This would be the perfect addition to our collection. Love the picture quality of this camera. Me too! It takes great pics. So the Square one is new, right? I had been coveting the Instax cameras for a while now and I just splurged and bought one at Best Buy with a gift card I had – they price-matched Amazon, which was nice. I got the ice blue kind. 🙂 but since film is so pricey, I’ve only taken 3 pictures so far. This one is new, yes, but Instax makes some really great cameras and printers. I love that colour! This looks like a retro idea that really works. I take a lot of pictures but print out so few so if this helps you get the prints i am so interested. It looks like it is also fun to use. It is so nostalgic, I love it. Yeah! Fun to use and EASY to use. I have always wanted to get an Instax camera! They are awesome! Love this post, I really want to get one now! Thanks so much! They are a lot of fun and oh so nostaglic. My almost 13 year old loves taking pictures. Her sister gave her her old slr, but I know that she’d love to have one of these! Digital is fun but, there is something special about film. I LOVE this! I think that this would be a great camera for my kiddos! They could have so much fun with it! They totally will, we sure do. I love fun cameras like this one! You had a fun photo shoot! Yes! We had fun exploring our little city. My daughter has been asking for one of these. Thanks for the review. We are debating on getting her one for her birthday. I will tell you, my daughters LOVE this one. Now that is an awesome gift. 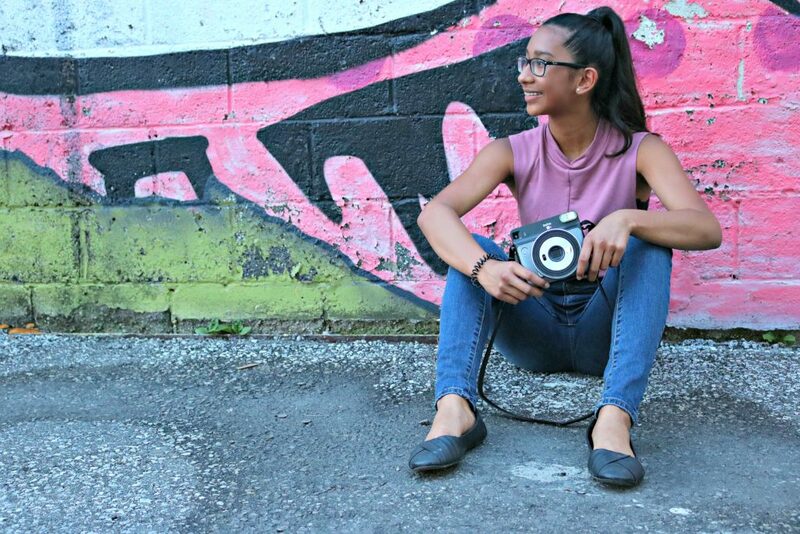 The aspiring teen photographer would love this one! What a great sounding camera, I have to admit I do love the idea of having instant photos – there is something special about snapping and having. Yes, it is so satisfying. Agree with you., cherish the memories and for me, picture is one of a great remembrance of every moment. 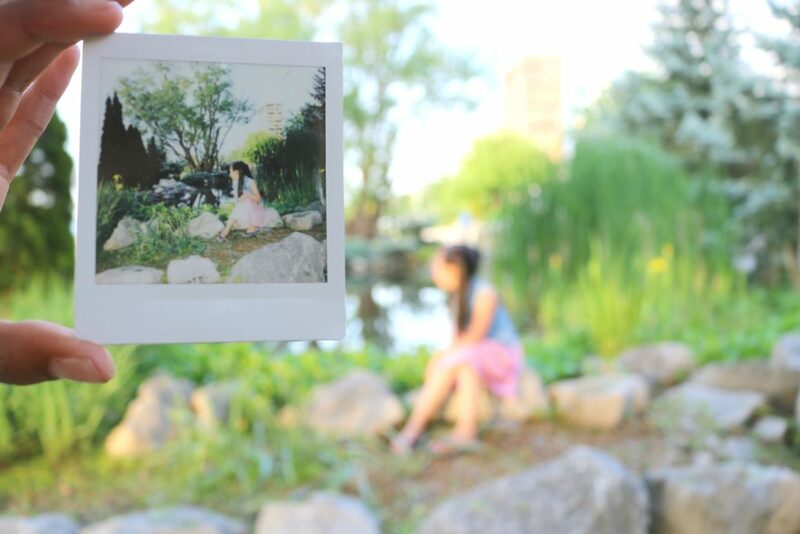 Having an instax makes you have an instant picture. Yes, it is so important to live in the moment and when you can, capture those special ones. 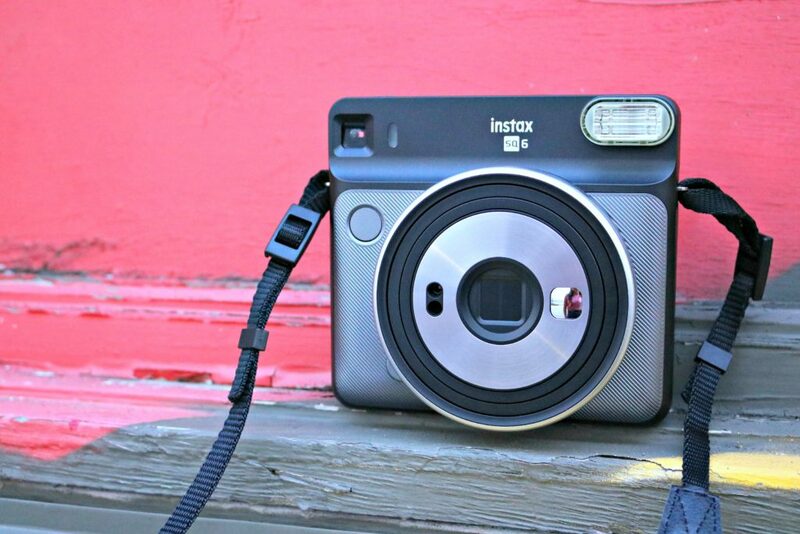 I haven’t seen this new instax camera yet and so want it! I am absolutely loving your photos! Thanks so much! Yes, it is new and you so gotta get it! 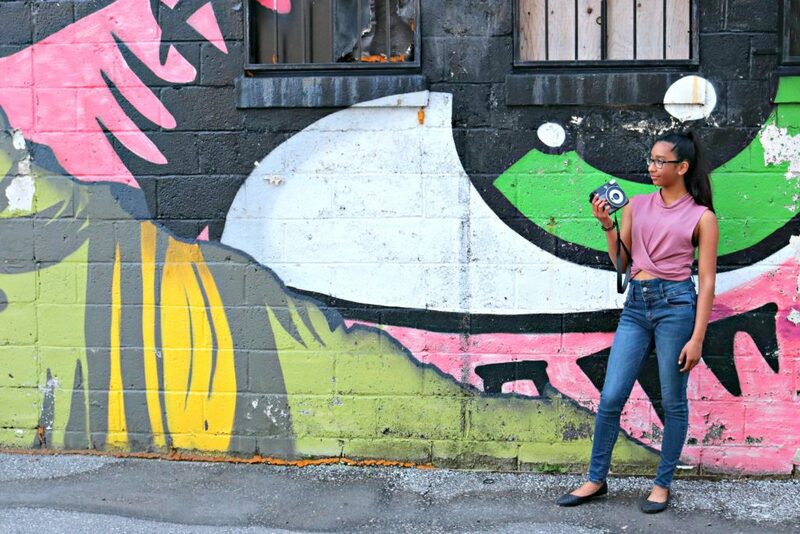 I would love to grab this fun little camera and take it on my next trip!! What a great post!! It fit perfectly in my camera bag. WOOT. Thanks Nancy for the detailed review,sounds like a fantastic camera.Beautiful family! I love it, I have been having lots of fun! I’ve been thinking of investing in a new camera and this Intax Square SQ6 sure takes nice photos! Yes, it is so nostalgic too!